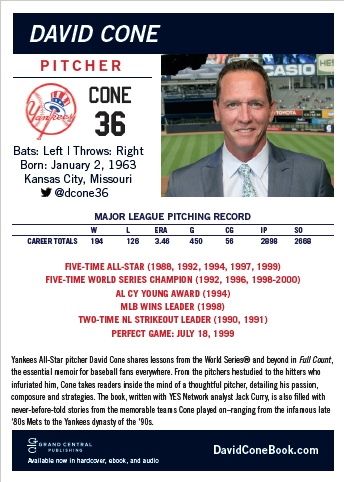 Pre-order Full Count in any format and fill out the form below to enter for a chance to win a Full Count baseball card autographed by David Cone! Met and Yankee All-Star pitcher David Cone shares lessons from the World Series and beyond in this essential memoir for baseball fans everywhere. “There was a sense about him and an aura about him. Even when he was in trouble, he carried himself like a pitcher who said, ‘I’m the man out here.’ And he usually was.” –Andy Pettitte on David Cone. 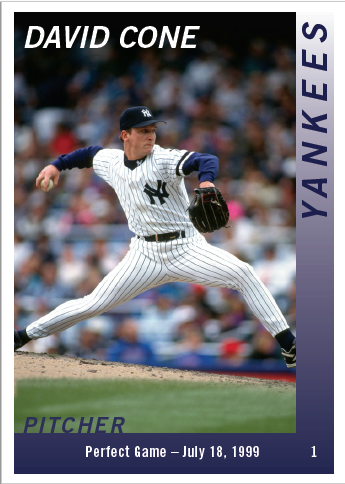 To any baseball fan, David Cone was a bold and brilliant pitcher. During his 17-year career, he became a master of the mechanics and mental toughness a pitcher needs to succeed in the major leagues. A five-time All-Star and five-time World Champion now gives his full count — balls and strikes, errors and outs — of his colorful life in baseball. From the pitchers he studied to the hitters who infuriated him, Full Count takes readers inside the mind of a thoughtful pitcher, detailing Cone’s passion, composure and strategies. The book is also filled with never-before-told stories from the memorable teams Cone played on — ranging from the infamous late ’80s Mets to the Yankee dynasty of the ’90s. And, along the way, Full Count offers the lessons baseball taught Cone — from his mistakes as a young and naive pitcher to outwitting the best hitters in the world — one pitch at a time.